At its peak in the first half of 2018, two mining pools operated by Bitmain (BTC.com and Antpool) held a combined hashrate of more than 42%. Bitmain also led a Series A round in ViaBTC, currently the fifth largest pool, but ViaBTC claims to be 100% independent. 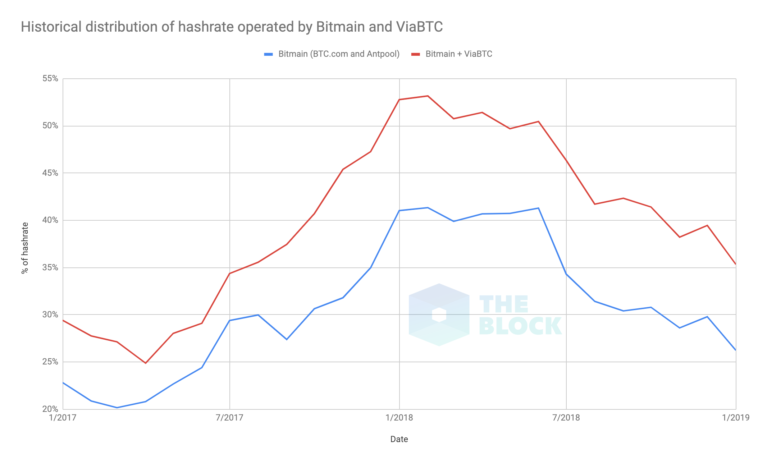 Moreover, Bitmain also never disclosed what share of its hashrate is physically operated by the company, which raised concerns when its hashrate was nearing 50% since the pool operator still controls the block templates. But since then, Bitmain-operated hashrate has started to dwindle. BTC.com and Antpool controlled approximately 26% combined in January. The apparent decrease could be attributed to the company’s recent struggles amid reportedly not being able to convince Hong Kong stock market regulators to approve its IPO application. A Bitmain employee said in December that the company is reorganizing its core mining operations and that the layoffs could impact up to 50% of staff. Since then, Bitmain has already announced the closure of two offices – Israel in December and Amsterdam in January. It also laid off workforce at the Rockdale mining farm in Texas.